Paper Straws: 500 million straws per day is an average of 1.6 straws per person (in the US) per day and paper straw is a more popular and Environmental protection way to enjoy life. Great To Pair With Your Party: Very hot white paper straws, perfect for weddings, parties, baby showers, your own restaurant or just around the house to have some fun, almost all occasions. 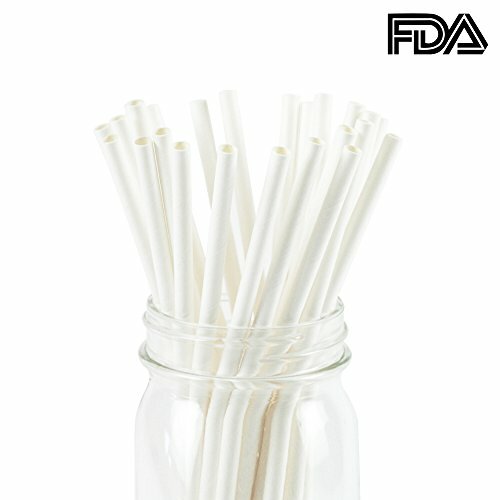 Perfect Size：Each straw is perfectly made to be 7.75 inches and 0.24 inches outside diameter, unlike some straws that get soggy after a few minutes of drinking these straws are built to last longer and stay strong. High Quality And Safe: The straws are made of paper so they will biodegrade even in a backyard compost, do not worry about environmental pollution and strict selection of materials, Please rest assured purchase. The Best After-Sales Service: If you have any questions about the product or some great advices please kindly contact us or leave your question here, We will solve your problems in the first time.